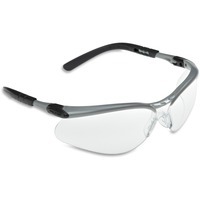 Sleek, contoured and fully adjustable, BX protective eyewear features a soft adjustable nose bridge, lens angle adjustment, and adjustable length temples for extended wear. Anti fog polycarbonate lens provides three lens angles for a cozy fit and absorbs 99.9 percent ultraviolet light. Recommended for assembly, cleaning, electrical, facility maintenance, grinding, machine operations, painting and sanding, these sleek, contoured and adjustable safety glasses help protect your eyes from impact and ultraviolet light. Safety glasses meet the requirements of CSA Z94.3 2007 and the High Impact Requirements of ANSI Z87.1 2003.